***Please note that the Sport-Link Attachment Base is not included and must be purchased separately *** this item is NOT compatible with the Club-Link Attachment Base *** also a license plate bracket that mounts to the center of the wheel is included. Another handy attachment for the Sport-Link™ system! 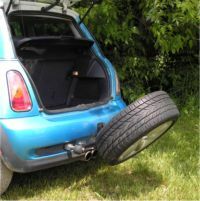 The Spare-Link is a great way to take along a spare tire for those trips a little further from home. Many MINI S Model owners have been unhappy with the performance of the stock run flat tires and have opted to run regular tires. This of course leaves you a little more vulnerable if you are far from home and quick service isn’t available in the event of an emergency. Why not take along a spare just in case! 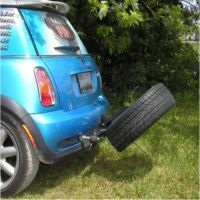 You can never be sure when that pot hole or some other road hazard is going to jump up and bite your MINI! The “Continental” look is definitely unique and will catch some inquisitive glances. The Spare-Link can be lowered just like our bike rack to allow for easy access into the hatch area. The unit comes with two matched locks and two keys. One lock secures the unit to the Sport-Link™ Attachment and the second lock secures the main post in an upright position. Both locks come with weather-proof rubber caps. Included is a lighted license plate holder that bolts to the center of the spare. (not shown) You will need to tie into the vehicle wiring for power for the license plate light. We recommend the use of the Power Taillight Converter when tapping into your wiring. Weight is approx 28lbs.